Jawatan Kosong 2018 di Kuwait Finance House (Malaysia) Berhad (KFH) | Permohonan adalah dipelawa daripada Warganegara Malaysia yang berkelayakan dan berumur tidak kurang dari 18 tahun pada tarikh tutup iklan ditawarkan untuk memohon jawatan kosong di Kuwait Finance House (Malaysia) Berhad (KFH). Kuwait Finance House (Malaysia) Berhad (KFH Malaysia) is the first foreign Islamic bank that was granted a licence under the Islamic Banking Act (Malaysia) 1983 on 8 May 2005. KFH Malaysia commenced Branch Operations on 8 August 2005. A wholly-owned subsidiary of KFH, the move to set up an office in Malaysia was on the heels of Bank Negara Malaysia's (BNM's) decision to open up the country's Islamic banking industry to qualified foreign players as recommended under its Financial Sector Master Plan. As the regional headquarters of KFH in the Asia-Pacific region, our main role is to provide innovative Shariah-based financial solutions to our customers. In addition, we act as the intermediary and facilitator to promote two-way investments and trade between Malaysia, Asia-Pacific and the Middle East. Our wholly-owned subsidiary, Kuwait Finance House (Labuan) Berhad is licenced to carry on offshore banking business in the Federal Territory of Labuan. 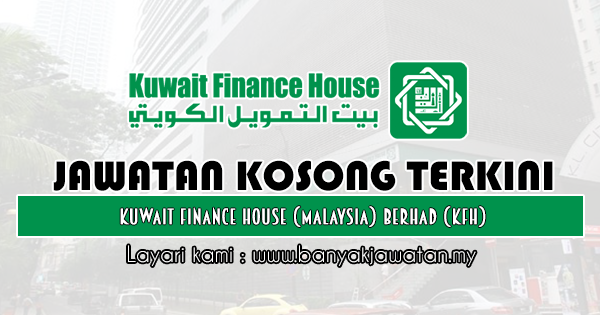 0 Response to "Jawatan Kosong di Kuwait Finance House (Malaysia) Berhad (KFH) - 25 April 2019"